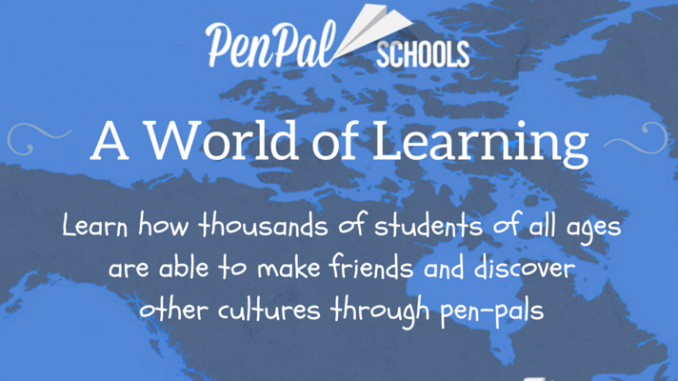 Lets look on PenPal Schools and how it helps to make pen pal friends. This website brings learners together from different backgrounds to share experiences and learn from each other, as an online learning community, students of all ages are able to make friends and discover other cultures, while they’re encouraged to learn and practice foreign languages and talk about pressing issues such as the economy, healthcare, immigration, etc. The website currently has over 70,000 students in more than 70 countries; connecting a whole class or individuals who sign up on their own. We have heard of other news related to pen-pals and how some people have used pen-pals for great causes, (see our post last week about pen-pals for children of incarcerated parents) but we hadn’t yet seen anything like PenPal Schools. As a humans right advocate, I believe that everyone should have the right and the opportunity to have an education, but sadly, for some children around the world that is not even an option, they’re forced to work to maintain their families or education outside of the home isn’t available. This is why organizations that care about educating these children are really changing the world, not just those children’s lives. It is great news to know that PenPal Schools is doing the great work of helping children receive a worldwide education, but it makes us even happier the fact that they’re using pen-pals to achieve it. As we explained above, teachers are able to sign up their entire classes, or if you’d rather do it individually, that’s also an option. Give them a try, and don’t just help less-fortunate students, help yourself open up your mind to what’s outside of your current education. Had you heard of PenPal Schools before? Leave your comments and thoughts below!